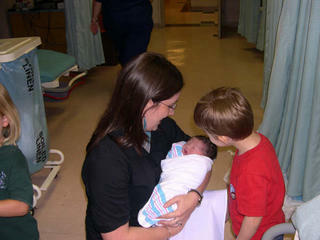 Last Kiss: do ones from my neice and nephew count? 2. Hot or Cold: Niether? To survive this semester as painlessly as possible!!! Super Duper: Finding a new coffee shop within a 2 min drive of my apt!!! I mean, seriously, who wants to hear, "You look tired." What do people think you have to gain from hearing those words? Think about it, what good does it do for someone to tell you that you look tired? If you really are tired, then you know it and you don't need someone to tell you that you look as tired as you feel, cause you're probably trying to cover it up as much as possible anyways. If you aren't tired then it's just plain rude, who wants to look tired? What are people thinking when they tell you that? I find it personally insulting and offensive. For example, a little old lady told me that today and I actually haven't felt better. I mean, what excuse would I have for being tired? I've had 5 days off to play with my family. Yes, it was a busy 5 days, but a great break from work and life! But what was it that made her think I looked tired? Do I have bags under my eyes, was I yawning? Seriously, I had a great, very productive day today, a nice lunch with my little old lady friends...life is good, I'M NOT TIRED!!! The thing is that this isn't the first time that I've heard this since I moved to Houston. I think it's a new thing for me because in college no one really says that to eachother. I mean, we understand that college kids live in a state of tiredness, and we know we don't want to hear it. But people I encounter in the real world love to tell me that I "look tired." Sometimes I think it's because I'm not wearing eye liner or mascara, or something to make me just look different and so then people assume it means I'm tired...I'M NOT TIRED!!! What I'm trying to say is, it would be in your best interest not to tell me that I "look tired." I know none of you would ever dare to, but instead, if someone looks tired, go ahead and tell them they look great! Think about it, if they really are tired, then the encouraging words will mean the world to them, if they're fine, then they'll appreciate the compliment!! I feel as though I owe the readers of my blog (all 3 of you) an apology. I never intended to neglect my posting for over a week!! But I promise, it was beyond my control! 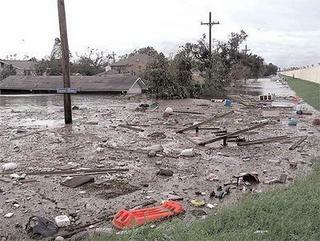 Having evacuated from Houston to my sister's in Temple to escape Hurricane Rita, I was without access to the internet. So, my apologies. Believe me, I understand the frustration of checking someone's blog, only to find a post you've already read. And then the next day, and the day after that. After a while you stop checking to see if they have a new post. I truly hope that I have not discouraged any of you from checking my blog. I promise, as long as it is within my control, to never not post for over a week again. I feel as though I must give my account of officially being a Hurricane Rita evacuee. Having read a few others' accounts, I feel as though I really was blessed by my travels. I was fortunate to beat most of the traffic and make a 4 hr drive to Temple on Wednesday afternoon. Usually it only takes me 2.5 hrs, so that wasn't terrible. My parents arrived from Corpus later that night (they were also evacuating the Hurricane that was threatening to hit CC) and we were all at my sister's through Sunday. My parents went home on Sunday, but my boss and I had decided that it would be best for me to wait out the traffic trying to get back into Houston on Tuesday. So I woke up this morning and hit the road. With a combination of waiting till Tuesday and taking some back roads I made fine time. To be honest it was a nice little free vacation!! I was glad to get back though, and try to resume some kind of normalcy. I do think I lost power at some point, all my clocks were blinking when I got home today, but other than that, all is well. Oh, for all of you who were wondering, the "Aunt's weekend" that I had previously mentioned had to be postponed due to the Hurricane. I just received confirmation that we will be doing it Oct 7,8,9. I'm still pumped and super excited that I still get to do it!! In keeping with the Hurricane theme, If you had to evacuate and could only take one thing from your house/apt, what would it be (exclude clothes) ? Oh yeah, I really enjoyed getting to see some of my friends in Waco while I was evacuated!! Fun times catching up! I love you guys! One more thing...you should all click on the link that says "father of my children" he has recently posted some rather funny, i mean personally offensive, posts. Check it, I promise, if you know me well, it will give you a good laugh! I hope none of you mind, but I'm going to have to get on my soap box today. I spent my day today as I spend all of my Mondays as of late, in class. I start with Systematic Theology at 8:25, then a chapel service at 11:00, then a group discussion class called Spiritual Formations at 12:00, then I wrap up my day with a 1:00 New Testament Survey. So, anyways, during the 12:00 class we had a guest speaker from the North American Mission Board. They were talking to us about church planting. Which I 100% support, it's a huge need across the states, and I might even be convinced that some day I could do that (Lord willing), but they went about it the completely wrong way!! They repeatedly stated that churches in America weren't doing their part and that 99% of them are dying!! Then they said, "It's easier to give birth than to raise the dead." That's insane. Can you believe that? They talked about all these unreached people groups in Harris County alone. Well, I understand the need, really I do, but I can't forget the fact that Tallowood has 5 mission churches that are all geared towards different people groups. I mean, you can't tell me that we are the only church that has missions for specific people groups. And not to mention the fact that the professor of my New Testament class is the pastor of an International church. You can't tell me that people groups aren't being reached!! I mean, I know there is a need, but they shouldn't discredit what work is being done and what needs are being met. I mean, it was like he thought local churches were completely purposeless. What does he think the churches that they are planting are going to be like? I mean, at some point in time each one of our churches were planted!! UGH!! I'm sorry if I'm not making any since, it just burns me up in side! It's just that this man was completely discrediting the local churches and the ministry that they provide. I mean, yes, we need to plant churches, especially in the North, but we can't all go, or then there will be no one left here. Okay, I'm done, sorry this hasn't been the most interesting post, but the man really made me mad today so I figured, where better to unload about it than on my post. On the up side, I do really like my classes and my profs. They aren't idiots like this guy was. Seminary is very time consuming and hard to juggle while being on staff full time, but worth it, definitely worth it. I really do enjoy it, as long as I live to see this Christmas! Friends, well, this may get really sappy, really fast, but I've been thinking about my friends a lot lately, so I thought I would devote a post to the idea of friends. Friends. Well, in our generation it truly was one of the icon shows that everyone knew and watched at least once. In 25 years we will all still make mention of it, like I Love Lucy and Fresh Prince and MASH. I think that says something about our culture, the lives we live. We are all dependent on friends. They come and go, enter and exit, but are almost always around. Some are closer than others, both physically and emotionally, some are more attentive than others, some are kinder, but all are present. They say you can pick your friends, and I guess for the most part that's true. Although there are some people you just click with and some people you just don't. But I guess that's how you pick your friends, usually the ones you click with. I like the fact that we don't always click with those who are just like us. Friends add variety to our life. Some friends are fun and spontaneous, some friends are constant and strong. Some friends are quiet and simple, some friends are loud and complicated. Some friends are irritating, some friends are overwhelming, some friends are sweet and some friends are just plain rude. Some friends are low maintenance, some friends are high maintenance. We need different types of friends at different times in our life for different reasons. God knows your heart and He knows your need and He always seems to provide the right friend for the right time or season. Michael W. Smith says "Friends are friends forever." While we may not think that is true as often times life moves on and friendships are hard to maintain, I like to think he is right. Friends are friends forever because they impact your life whether or not you like it. You take a small (or a large) part of them with you and that changes who you are. That's why we have to be careful who we surround ourselves with. We will inevitably become like them, so choose wisely. I want to say that I am extremely grateful for the friends in my life!!! New and old alike. I will forever hold on to my old friends, you all know who you are. Many of you live in different cities, some even far away states, but all of you live very close to my heart. My college years would not have been the same without a single one of you and for that I am grateful. While I tell people that I miss college all the time, the truth is I just miss you guys, my friends, so very dear to me. I guess moving and "growing up" really teaches one to appreciate the friends in her life. In that same breadth I wouldn't still be where I am today without the friends that the Lord has provided since I moved to Houston. God has been so good to me and allowed me to meet wonderful people with whom I can share life with. Of course you never replace friends, you simply add to your collection!!! Well, I think I'm done being sappy, seeing as how I'm almost all choked up (and I'm sure you all know I don't really cry). This post has been devoted to you, the readers of my blog, my friends for life (wow, just when you thought it couldn't possibly get any cheesier!!) I love you all and hold you very close to my heart. Many blessings upon you. If I ever take you for granted I am sorry, know that I don't mean to and I love you very much! Much love! ~I got to sleep later today than any day in the past 3 days. ~I found out that I'm going to get to take the whole week of Thanksgiving off and spend it with my family!!! ~I found out that in 2 weeks my sister, Kelly; my niece, Ashlyn; and my nephew, Brady; are all coming to visit me for a fun weekend with the aunts (that's me and Kelly)!!! I'm super excited. We are going to take them to the children's museum, the candy store, the carousel, Build-a-bear, anywhere they want!! It will be super! ~I got to watch the season premiere of Gilmore Girls!! It was soooo good, but still kinda sad. ~My friend Rebecca came over to watch it, yeah for fun friends! Um, maybe that's all that really happened to me today. I guess the other thing that made it a good day was that nothing bad really happened. You know, I just got stuff done and minded my own and then got to come home. Hmmm....maybe days like today shouldn't come very often. It's almost like I wasted a day. I mean, I didn't do anything terribly significant. Now that I think about it, it was a loss of a day. I don't want to have days go by just to get to the next one. Someone once told be that we must live intentionally. That's it, I need to live more intentionally. I'm going to work on that. Making each day count. Making a difference in at least one person's life each day, so that that day isn't lost. Yes, today was a fine day, but not a day that I will remember because anything significant happened. So, here's to making a difference and making each day count. I'll let you know how this works out for me and if I make any progress. Sorry for this random tangential thought, but hey, what's a blog without a few theological thoughts here and there. I mean, I am a seminary student you know, it comes with the territory! That's all for now, hope you enjoyed my ponderings. The joy of my life! I find myself needing to read so that then I can write my paper, but really not wanting to, so what do I do? I put up a new post on my blog! I realized earlier today that I really hadn't done my nephew justice by only putting up one small pic of him over a week ago. So, I thought I would do a little gallery with pics of him and my other neice and nephew. This is one I took the other day. It was the first time Brady, his 3 1/2 year old brother, really got to hold him on his own!! Brady was so excited. 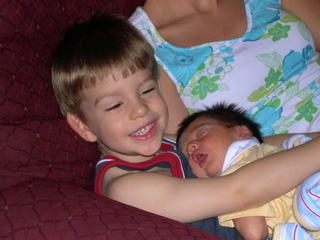 He really is the best big brother ever!! This is the day Blake was born!! He's only a few hours old in that pic!! 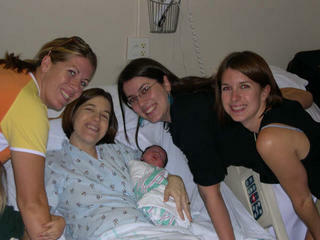 Me and all my sisters on the day that Blake was born!! I love my sisters and I love being an aunt! I had to get a good one in of my sweet Ashlyn!! She's also 3 1/2!!! She's so cute, she's really Blake's cousin, but she says she's his sister! It's so sweet! Again, I love being an aunt...there's nothing like it! -Friends most of all (and no, i don't mean the TV show)!!! I'm sure there's more, I'll add later, for now it's late, off to bed! Oh dear, where to start? I know last week some time I posted about all the things I need to get done, but yet was not motivated to do them. Well, now it's not a matter of motivation, it a matter of only having 24 hours a day. Let's start with the fact that I spent last Friday and Saturday at the Evacuee shelter my church opened. Then I left town on Sunday to spend wonderful time with my beautiful neice and nephews! Man, they make all the problems in the world suddenly fade away! What a wonderful time we had! Then I drove back this morning (waking up at 6:00 am to get to work on time!!!) for a full day of work. Let's start there, when I woke up my throat was scratchy and I kept sneezing. I still havn't decided if it's allergies or if I'm getting sick. 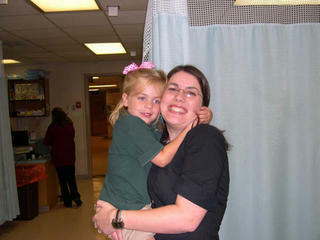 Then, I got to work right around 9:15 and had my hands full as I was walking in and poured my coffee all over my purse. I got over it and went into the bathroom to put "my face" on before I saw anyone without any make-up on. As I was preparing myself for the day I dropped my base on the bathroom floor and it exploded on the tile floor splattering all over my shoes, legs and nice black professional skirt!! ugh! What a start to a long day. I'll spare you the rest of the details, but let's just say it was 10:00 before I got home!!! And tomorrow won't be much better. Oh yeah, and while I'm unloading let's talk about the fact that I have a friend's friend (who I've only met once) coming to stay with me Thursday-Sunday and my apartment is a complete mess (see previous post). And don't forget that I committed to stay up all night on Friday at the shelter, and one more thing, I have my first seminary paper due on Monday and I've only read 1/3 of the book!! Not to mention all the other reading just to keep up with general class discussion and quizzes. I'm trying to remain calm, but things are a little overwhelming right now!! I keep telling myself that it will all get done, I just keep wondering when and how and if I"ll be alive to see it all get done! Okay, I'm done. Life is good. I love my job and my apartment. I just need to learn to prioritize and be extra efficient. I'll let you know how that works out! Okay, time to get some reading done before the night is completely lost! Words don't even begin to describe the massive destruction that the Gulf Cost has experienced this week. It's nothing short of overwhelming. The storm hit Monday morning, it is now 6 days later and there are still people trapped on their roofs. There are still thousands of people in the Superdome of New Orleans that are waiting to be evacuated. It's horrifying to think of what these people have had to go through. The only cool thing is to think about how the American people have come together and tried to help as much as possible. I don't think that there is anyone who hasn't pitched in. I spent 13 hours yesterday helping set up the shelter at Tallowood Center. It's pretty cool to see the Body of Christ come together to do anything at all possible. I don't even know how many people came to the shelter yesterday to pitch in and drop off clothes, water, food, blankets, toys, etc! It's wonderful and I know the evacuees appreciate it! We had close to 30 people in our shelter last night and expect to reach capacity today or tomorrow. That would put somewhere around 100 people in the space we have prepared. I turn on the T.V. and I just can't stop watching, but at the same time it's so emotional to see all that those people are going through. They have been separated from their families and are just doing anything they can to survive. I truly can't fathom it, and I believe that it is impossible to "put yourself in their shoes." Okay, I'll stop, I know it's no fun to have a serious post like this, but it's all that I can think about. I'll do my best to be more cheery next time.